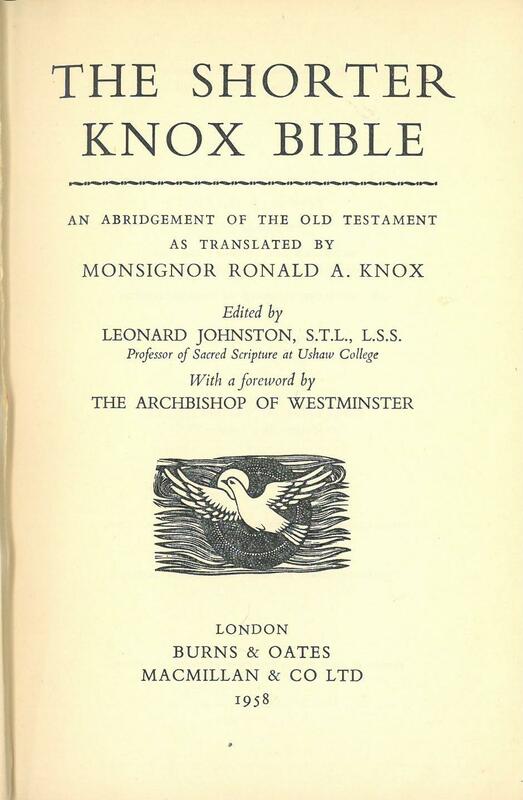 Ronald A. Knox (1888-1957) was first a minister in the Church of England, but at age 29 he converted to the Roman Catholic Church. 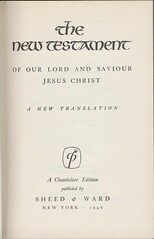 In the late 1930s he received an official commission from the Catholic Church to translate the Bible from Latin into English. 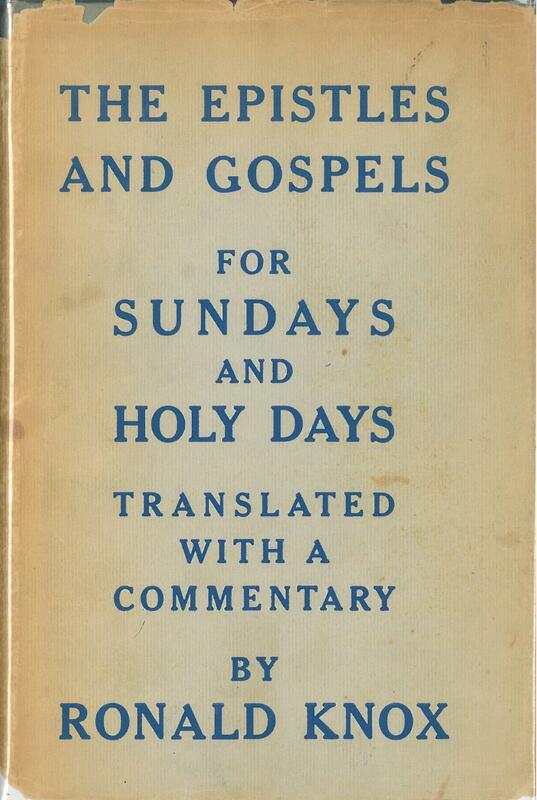 He completed the Book of Revelation in 1942 and the complete New Testament was published in 1944. 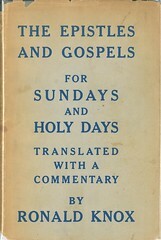 His translation of the complete Old Testament was published in two volumes in 1948 and 1950. 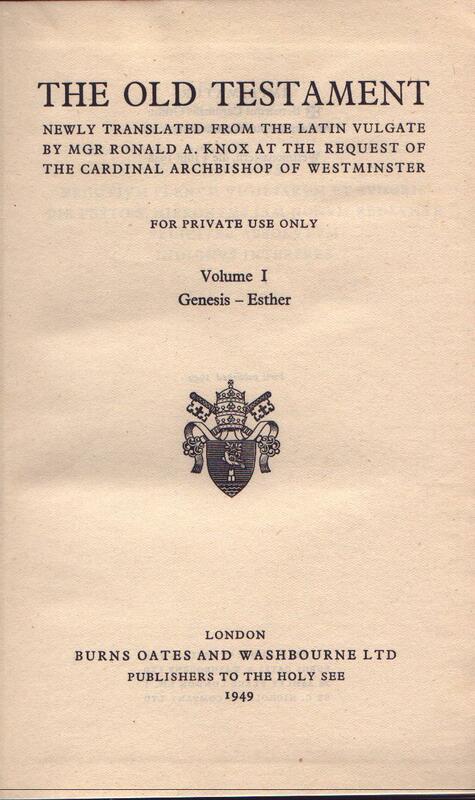 This was the second English Bible to be officially recognized by the Catholic Church hierarchy (the first being the Challoner revision). 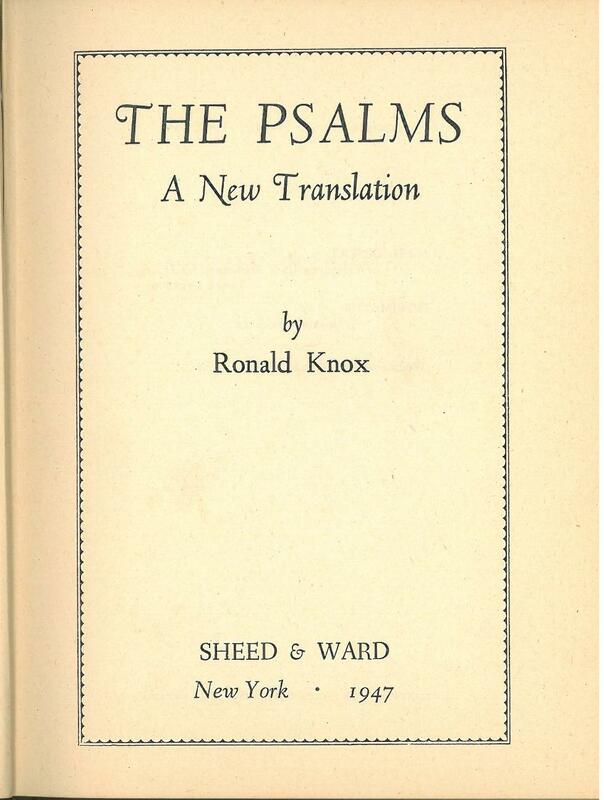 Click here for sample verses from Ronald A. Knox's translation. 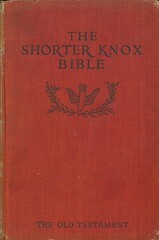 The 1944 edition was issued as a "trial edition" and Knox invited readers "to express in general their approval or disapproval of the lines he had followed, and to point out any passage which, in their opinion, specifically calls for correction." 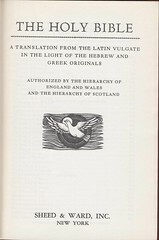 The editions published 1944 by Burns Oates and Washbourne in England and the one published by Sheed & Ward were of this "trial edition." 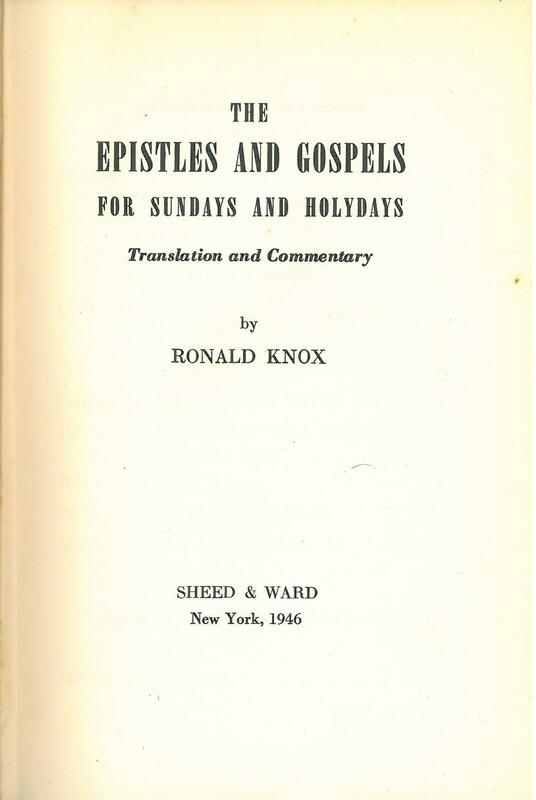 After reviewing the comments Knox made at least two changes, The first was in John 21:5 where "lads" was changed to "friends" and Acts 20:18 where "It is within your knowledge" was changed to "You yourselves can testify." 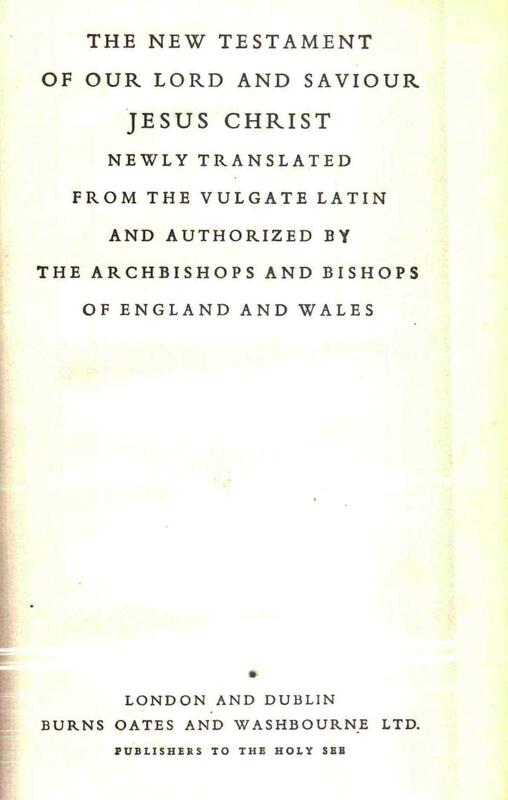 The editions after this change have the word "authorized" in their title. 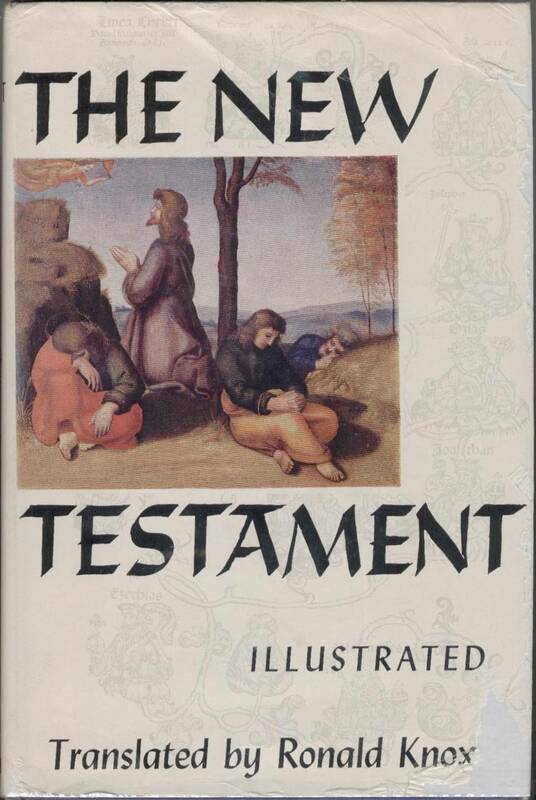 Contents New translation of the New Testament for Catholics by Msgr. 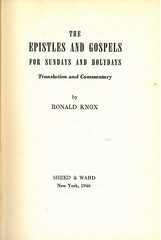 Ronald A. Knox (1888-1957). 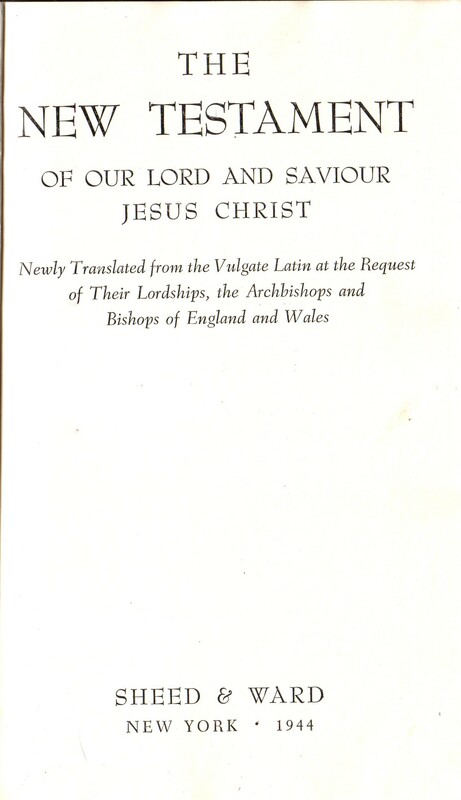 References HERBERT 2284, POPE 681-12, CHAMBERLIN 579; TALIAFERRO-BVE CN00023, Taliaferro-EELBV 7895.100. 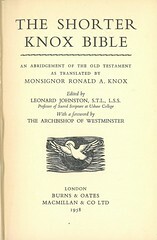 Comments Originally issued "for private circulation only" Knox's translation was soon accepted for use in liturgical readings in British Catholic Missals. References HERBERT see 2284, HILLS 2429, POPE 681-12, CHAMBERLIN 579; TALIAFERRO-BVE CN00023, Taliaferro-EELBV 7895.100. 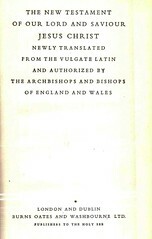 Contents New Testament for Catholics by Msgr. 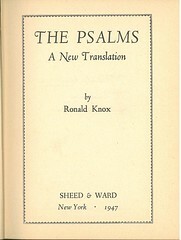 Ronald A. Knox in its finalized form. 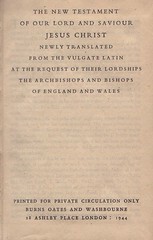 References POPE see p. 503-504. References CHAMBERLIN 43-2, 579-3; HILLS 2450; TALIAFERRO-BVE CN00023, Taliaferro-EELBV 7895.102. 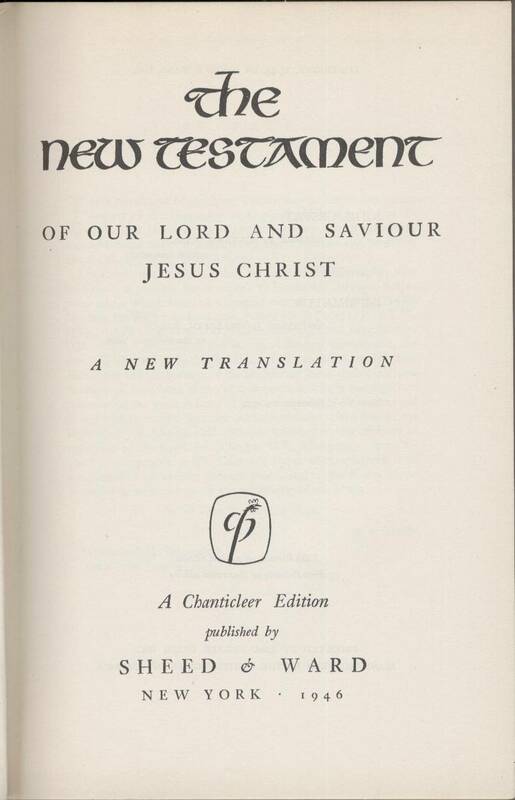 Comments "This edition of Monsignor Knox's translation of the New Testament has been designed to bring the reader an especially fine volume. 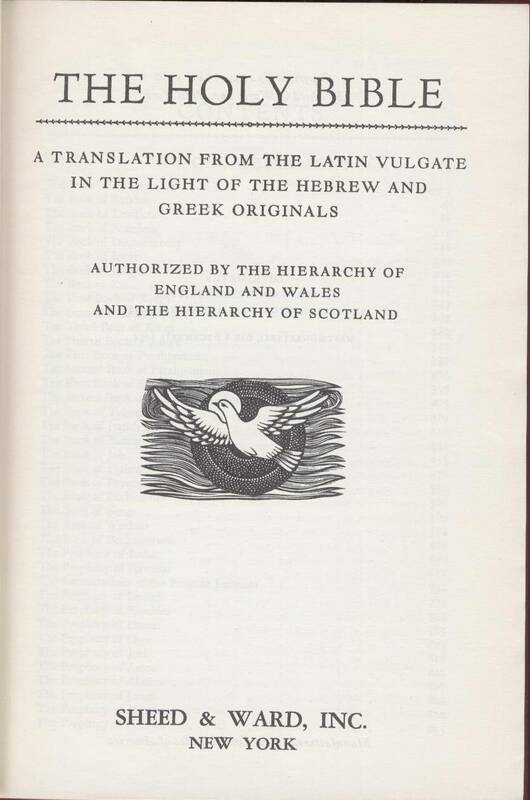 The color illustrations were selected from museums and art galleries in the United States and England by Dr. Hans Tietze." 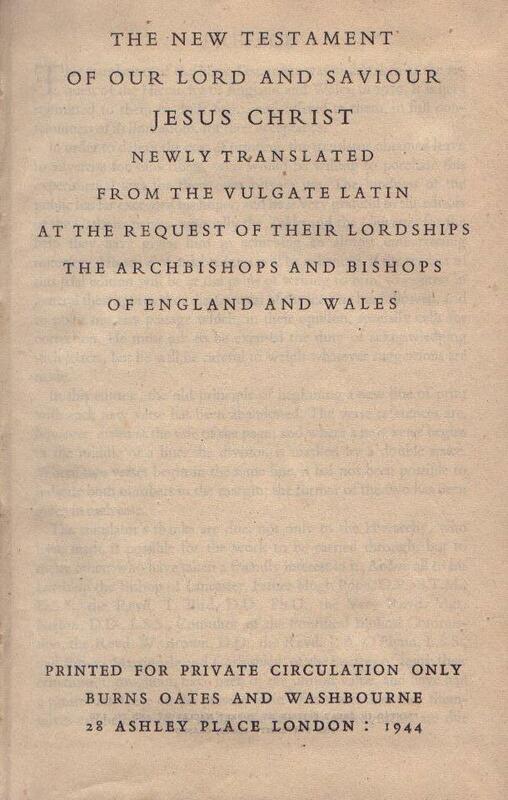 References: Chamberlin 43-2, 334-7, Hills 2463, Herbert 2290, Taliaferro-EELBV 7895. 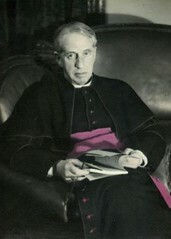 References HERBERT 2296, CHAMBERLIN 43-2, 123-1; TALIAFERRO-BVE CN00023, Taliaferro-EELBV 7895.105, 7895.106. 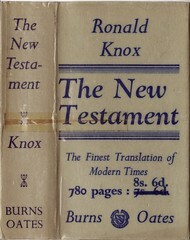 Contents Translation of the Old Testament by Knox. 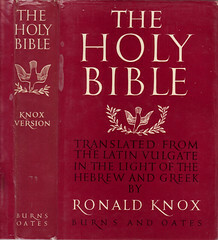 This 2 volume edition completes his Bible translation which received wide acceptance by Catholics in England, Ireland, and America. 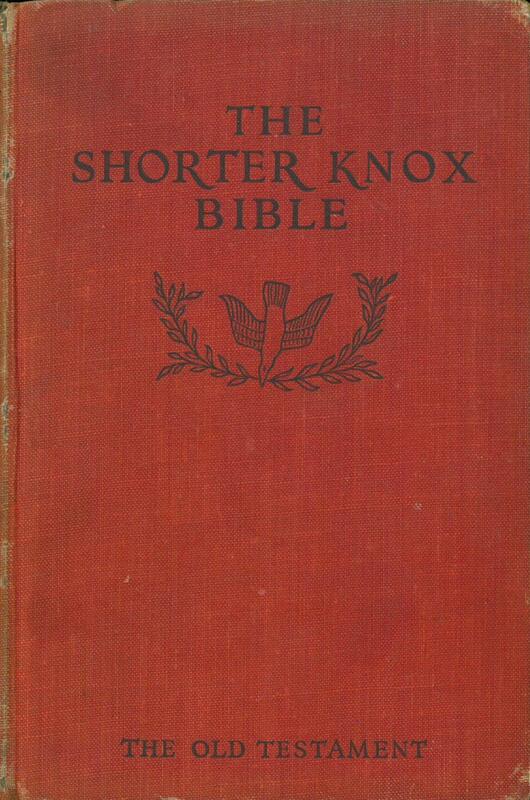 Contents: An abridged version of Knox's Old Testament. 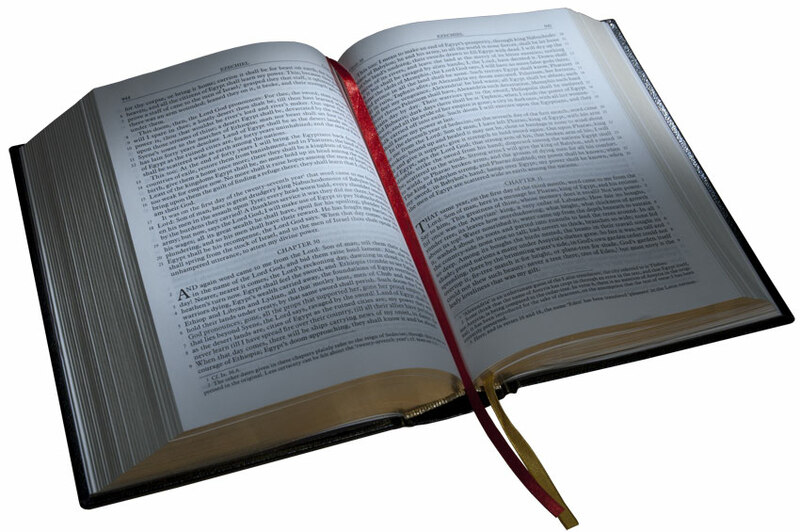 Comments: There is no evidence that an abridged New Testament was ever published. 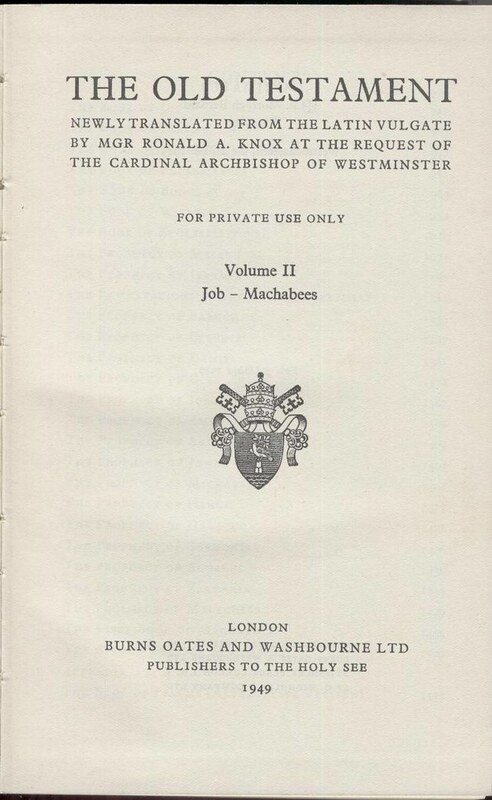 References CHAMBERLIN 43-2; HERBERT see 2296, 2284; TALIAFERRO-BVE CN00023, Taliaferro-EELBV 7895.110. 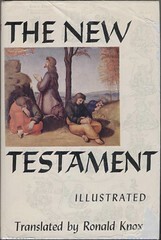 Contents: Complete New and Old Testament, translated by Msgr. 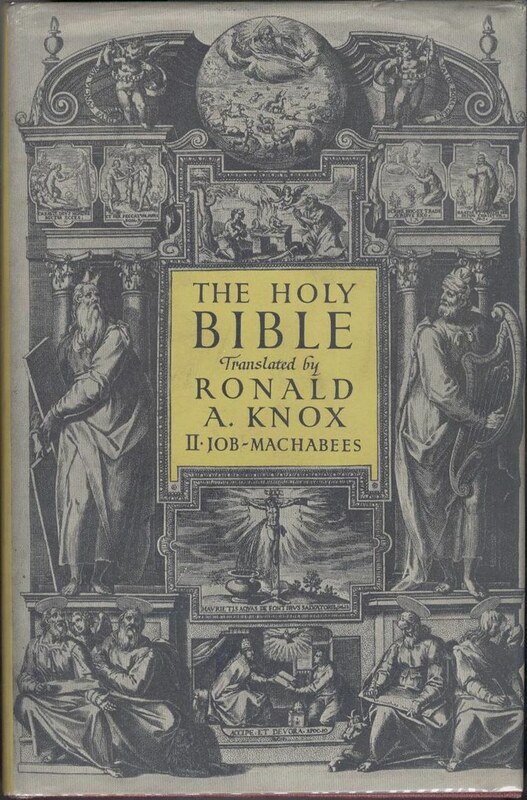 Ronald A. Knox (1888-1957).